The JSON Editor makes it possible to easily view, edit, and validate JSON documents. 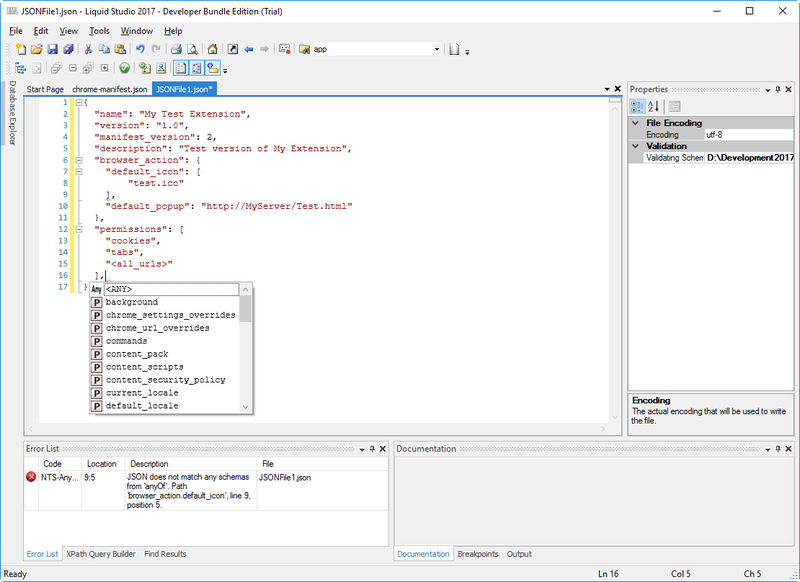 A rich text based editor provides syntax highlighting, well-formed and schema aware validation, auto complete/intellisense based on a JSON Schemas, go to XSD definition, and much more. The JSON Editor intelligently calculates the auto complete options from an associated JSON Schema (Draft 4.0 or Draft 6.0). So you are presented with the properties, and types that are permitted, at the current location in the file. Annotations are read from the JSON Schema and presented as tooltips, to provide context sensitive help. A JSON Schema can be inferred from a sample JSON document, the resulting JSON Schema can then be refined manually if needed using the JSON Schema Editor. Associating a JSON Schema with a document provides validation and intellisense. The document outline shows the current JSON document as a tree. The selection in the editor and the document outline remain in sync making it quick and easy to navigate large or complex documents. Jumps to the JSON Schema definition of the currently selected item within the JSON Document. Determines if a JSON document is both well-formed and valid against an associated JSON Schema. Errors are shown inline within the JSON document and in the error window as you type. The JSON Editor allows elements within the JSON document to be collapsed, thus maximizing your working area to simplify editing large files. The JSON Editor provides a 'Format JSON' option which indents all the elements correctly, making the JSON document simple to read. The JSON Editor provides syntax highlighting which makes your JSON code easier to develop, allowing errors to be avoided. The user is notified when the file they are working on is changed by an external editor. Liquid JSON Studio contain a powerful SpellChecker. The SpellChecker highlights spelling mistakes inline in real time as you type, mistakes can then be corrected by clicking on them and selecting the correct spelling.